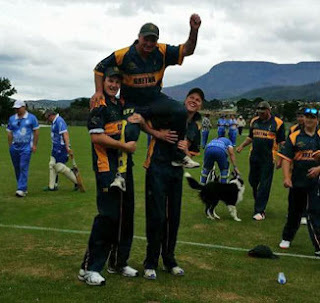 GRETNA'S Brian Smith has proven age is no barrier when it comes to the game of cricket. The 54-year-old recently played his 300th game for the Gretna Cricket Club and in all, the evergreen cricketer has more than 600 games under his belt. The wicketkeeper/batsman played his first game for Gretna in November 1999, aged 37, and since then has played 117 games for Gretna I and 183 for Gretna II. 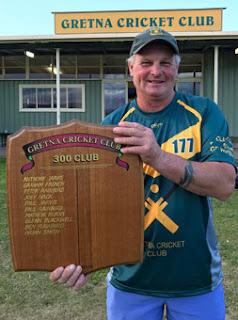 Now in his 18th season at the club, Smith has won 11 batting average trophies, six batting aggregates, three Best All-rounder awards, four Players Awards, 12 Most Catches awards and one Best-in-Finals, He has served as captain of Gretna II and played in two premierships. And that's just at Gretna. The veteran also won many other awards with clubs such as Westerway-Maydena where it all began in 1981/82 at aged 19. The club won the flag that season. He then had 12 seasons with Glenora-Ellendale where he won nine Batting Averages trophies, played in two premierships and was awarded life membership. Smith had three seasons at Old Beach, playing 55 games for one premiership. He also had stints at Kempton and Bushy Park, where he won the batting average. In season 1983/84 when playing for Glenora/Ellendale, he scored 1088 runs, making three centuries winning the Derwent Valley Cricket Association's cricketer of the year award, an title he would win on two more occasions, along with seven DVCA and SCA batting average awards. His highest score was a staggering 168 against Westerway/Maydena while playing for Glenora-Ellendale. game, which was played at Shoobridge Park recently. On a bad day at the crease, the word retirement can be heard from the bloke they call "Old Fossil", but when asked after achieving the magical 300, Brian declared he would go around again. "I'm feeling pretty fit for my age and I still love the game and the club has been great to me," said the farm hand of 28 years at Hop Products Australia in Bushy Park. Well done Brian, you are a great character of of the game who is respected by all and you sure have been and continue to be a great cricketer and bloke, both on and off the field. In addition to add to his cricketing career, Brian has also played more than 400 games of football, but that's another story. Brian is the 10th player at the Gretna Cricket Club since 1977/78 to have reached the 300 game milestone.